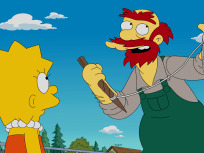 On The Simpsons Season 26 Episode 22, Groundskeeper Willie is named the coach of the Mathletes and Lisa must help when the school suffers a a technical meltdown. 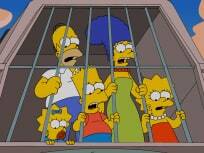 On The Simpsons Season 26 Episode 21, Homer ends up getting sent to rehab for bullying Ned's children who don't understand why he's always so mean. 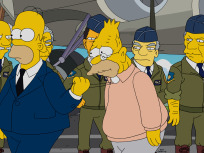 On The Simpsons Season 26 Episode 20, Bart begins smoking, trying to impress Milhouse's Dutch cousin, Annika and Grampa talks about his days in the Air Force. 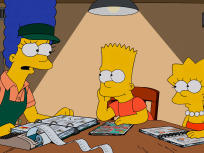 On The Simpsons Season 26 Episode 19, when Homer finds an old roll of film, the family learns how Bart and Lisa first started fighting with one another. 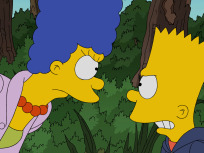 On The Simpsons Season 26 Episode 18, a skeptical Marge decides to follow Bart when she doesn't believe his story about not being involved in a bulldozer incident. 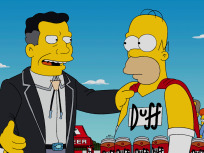 On The Simpsons Season 26 Episode 17, Homer wins a reality competition making him the replacement for Duffman but he must remain sober to keep the job. 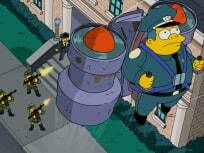 On The Simpsons Season 26 Episode 16, when Chief Wiggum's jet pack hits the church, Marge and the congregation look into questionable means to raise the money to fix it. 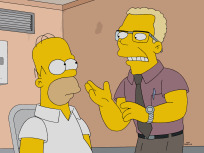 On The Simpsons Season 26 Episode 15, Homer is put in charge of taking care of a princess as her father works out a uranium deal with Mr. Burns. 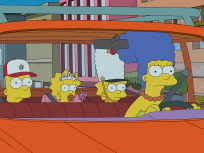 On The Simpsons Season 26 Episode 14, Marge finds a job as a driver for a transportation company when she's had enough of chauffering her kids around. 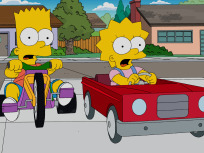 On The Simpsons Season 26 Episode 13, Lisa decides to compose a new town anthem when she uncovers that Springfield's was stolen from another town. 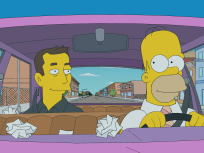 On The Simpsons Season 26 Episode 12, Homer and world famous inventor Elon Musk (voiced by himself) revolutionize the nuclear power plant which angers Mr. Burns. 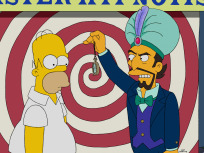 On The Simpsons Season 26 Episode 11, Bart takes advantage when Homer is hypnotized at the circus and is made to think he's a young boy again. 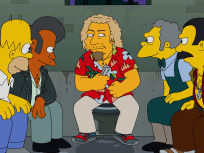 On The Simpsons Season 26 Episode 10, Homer finds himself on the locals' menu when he and the family are transported to Kang and Kodos' home planet. 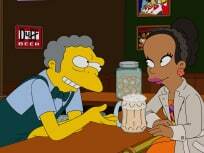 On The Simpsons Season 26 Episode 9, after Moe convinces Homer to stay out drinking on Christmas Eve, Marge tells him not to come home. Homer begins playing the bass guitar, leading him to make a garage band which helps propel one resident of Springfield to stardom on The Simpsons. 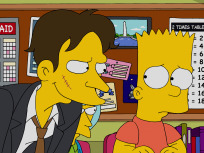 On The Simpsons Season 26 Episode 7, Bart is on a mission to get revenge on his new fourth grade teacher after he punishes him with a terrible haircut. On a The Simpsons / Futurama crossover episode, the Planet Express Crew arrives in modern day Springfield. 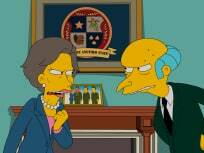 On The Simpsons Season 26 Episode 5 Lisa attempts to counter Mr. Burns' fracking operation by bringing in Assembly Woman Maxine Lombard, but can't believe it when two political opponents take a liking to each other. 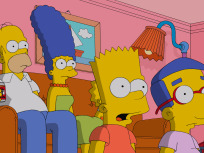 On The Simpsons annual Treehouse of Horrors, Bart and Lisa find themselves in Hell and the characters do spoofs ofH A Clockwork Orange and The Others. Marge opens a sandwich franchise on The Simpsons but her successful business is in jeopardy when another franchise opens up across the street. 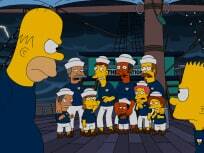 The Simpsons brings us aboard the "Relation-ship" when Marge sends Homer and Bart on a therapy cruise. 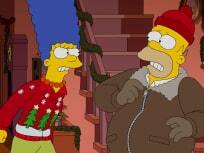 Back at home, Marge takes over Homer's fantasy football team. The town of Springfield is shocked at the news of Krusty the Clown's retirement in the Season 26 premiere. Sorry Marge, but I am the royal babysitter. If I start watching commoners, the tongues of the court will be a wag. Rabbi Krustofski: What did the burning bush say? 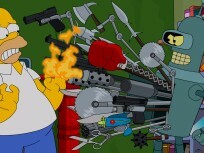 Krusty: It said ow! Put me out! How many talking bushes do you think there are? Permalink: It said ow! Put me out! How many talking bushes do you think there are? 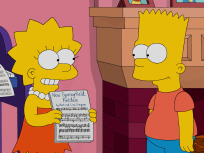 The Simpsons Season 26 Report Card: Grade It!